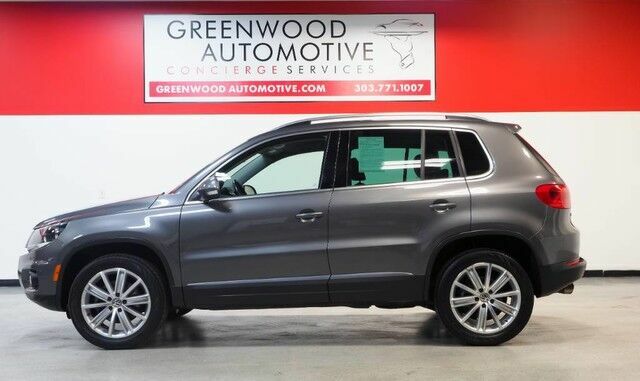 This 2014 Volkswagen Tiguan R-Line is offered to you for sale by Greenwood Automotive. The best part about this well-maintained vehicle is that it is a CARFAX one-owner vehicle. Do so much more with one vehicle. This Volkswagen Tiguan gives you everything you need an automobile to be. Enjoy driving? Well now you will get more thrills behind the wheel thanks to the heightened performance of AWD. Better handling. Better traction. Better driving experience. The Tiguan R-Line has been lightly driven and there is little to no wear and tear on this vehicle. The care taken on this gently used vehicle is reflective of the 23,193mi put on this Volkswagen. Intricately stitched leather and ergonomic design seats are among the details in which test drivers say that Volkswagen Tiguan is in a league of its own This Volkswagen Tiguan R-Line is in great condition both inside and out. No abnormal "wear and tear". More information about the 2014 Volkswagen Tiguan: The Volkswagen Tiguan goes up against a long list of strong rivals like the Ford Escape, Honda CR-V and Subaru Forester, and it stands out even in that crowd for its very refined, economical engine, crisp handling and very cleanly styled, nicely appointed interior. Feature-wise, with the introduction of the new Car-Net system and upgraded Fender audio, the Tiguan is now also near the front of the pack for entertainment and connectivity. Furthermore, the new Tiguan R-Line takes all the sporty potential in the Tiguan's design and makes the most of it from an appearance standpoint. Strengths of this model include manageable size, spacious seating arrangement, good flexibility for cargo, effective, all-weather all-wheel drive system, Strong, refined engine, and upgraded navigation, connectivity and sound systems Carfax reported accident minor damage. We Repaired front finder and front bumper at Fairway collision. WWW.GREENWOODAUTOMOTIVE.COM for all Photos Our Dealer Handling fee of $499 is included in our advertised price. Government fee's and licensing are additional costs. For best service and to check availability or to set an appointment to see and drive call Steve direct at 720-339-1516 or Marc at 303-552-7909 For more information. FINANCING AVAILABLE. TRADES WELCOME. *VEHICLE IS FULLY INSPECTED BY OUR MECHANIC. We are located 4 Blocks West of I-25 on North side Of Arapahoe, Behind US Bank at Syracuse St.